An interdisciplinary scholar, Claude trained at the Making Culture Lab from 2011 to 2015 when she was undertaking a SSHRC-funded PhD at Simon Fraser University’s School of Interactive Arts & Technology. She later pursued design and aesthetic inquiries on digital urban technologies in two back-to-back F.Q.R.S.C. and SSHRC-funded postdoctoral programs of research at McGill University’s Department of Art History and Communication Studies from 2015 to 2018. 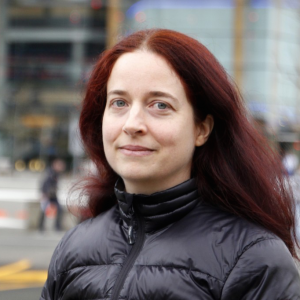 Following her postdoctoral fellowships, Claude became a Resident Scholar at McGill University’s Centre for Interdisciplinary Research on Montreal (CIRM). She now researches local expressions of digital social innovations. Claude’s engagement with technology research builds on a solid foundation of academic studies in the humanities, social sciences and fine arts, as well as a college degree in pure & applied sciences. Claude has also been an accredited professional member of the Quebec Craft Council since 2000 following the completion of her two-year craft & design diploma in ceramics. Her unfulfilled dream is to design, make and sell a line of smart and interactive ceramic objects. During her doctoral studies and her years at the Making Culture Lab, Claude learned to use a multisited design approach to study digital public displays deployed in urban settings. Her design research was concerned with unleashing the interactive potential of screen-based systems at the scale of the built environment by focusing on their social affordances and public vocation. The core site of her fieldwork was Montréal’s Quartier des Spectacles, where she spent two years investigating the design and usage of interactive digital installations in public space, which included a ten-week field study on Mégaphone, a monumental-scale digital public art installation designed by Moment Factory as an interactive agora and “Speakers’ Corner”, and deployed in a downtown Montréal plaza in Autumn 2013. Watch the National Film Board of Canada Interactive Studio five-minute video featuring “The Best of” Mégaphone. Claude then obtained a three-month SSHRC travel award that landed her in Melbourne, Australia, where she wrote a book chapter and conducted a field study of Federation Square, while she was a visiting research fellow at the Research Unit in Public Cultures housed in the University of Melbourne’s School of Culture and Communication.